In the painting of “Yemanya,” she is depicted in her most ancient primordial form as a Mermaid. 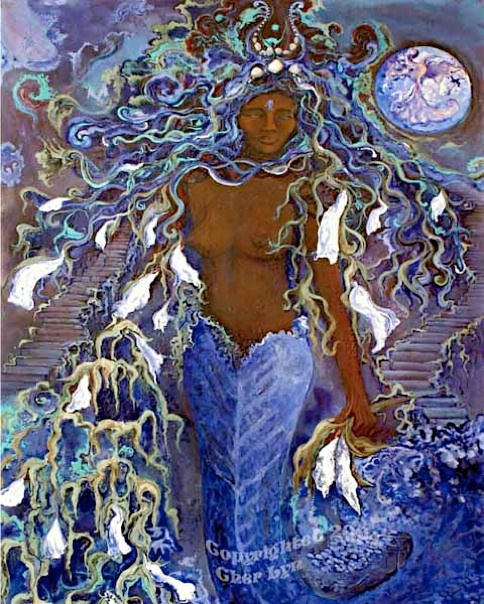 Yemanya is the Goddess of the oceans and the moon, she is said to have created the oceans and the seas. Her vastness expands as wide as the oceans and so does her compassion, yet she is just as powerful as a warrior goddess in defending and protecting her children. The ocean is the root of life upon the earth and Yemanya’s connection to the waters runs deep as a nurturing Mother Goddess who grants wishes when asked. On December 31, people of Brazil who honor her, offer white flowers and little boats put into the waves upon the sea, it is said if she agrees to grant your wish, she swallows the boat in her waves, if not, it washes back onto the shore. Yemanya, the Great Mother, is honored in Africa where she originated in the Yoruba tradition. Although there is a legend that speaks of the Great Mother Yemanya originally coming from Egypt associated with the Great Mother Isis. Theory goes, there were Nubian slaves in Egypt and when they returned to West Africa they brought with them the religion and mysteries of Isis where the goddess received a new name, Yemanya. Due to the slave trade she made her way to the America’s and is celebrated in the Caribbean and South and North America as well. The golden starfish brings in the magic of five in transformation for all that is out of balance, being brought back to Grace. The Water bird takes flight when the moon is in her full power, gracefully climbing upwards in divinities dance. Seaweed and feminine flowering Datora, mystically grow and flow, in a graceful dance in her mermaid paradise under the sea. The seahorse swims in her world, showering energies of love that are returning us to balance with our nurturing masculine side. In a state of graceful receptivity as one of Her qualities, Yemanya the Mother Goddess on her thrown, in her element gives freely her compassionate love and blessings. Goddess of the oceans and the moon. Mami Wata lives... her flowers are in bloom. we can all see her in grace on her mermaid thrown. Receptivity is a welcoming feminine quality; an awaiting prayer that grace occupies in an abundant flow in and swaying out like the currents under the sea. Humanity has to reconnect to the feminine grace and receptiveness as opposed to aggressive action. Yemanya is recognized as Mami Wata, mother of water, therefore asking her feminine medicine to help with managing our emotions with a sense of mastery. Trusting in the Divine can lead to a dive in the waves at the moment when doubt and fears can be washed away by an instrument of gratefulness to Her healing waters. Society has fallen in love with the terms, “the oneness of all being, about infinite consciousness, love without condition” and “Grace,” as if they were something apart and outside of us. As if they were something separate that we need to strive for and attain. In truth we are grace right here living breathing, being fully realized as soul incarnate, the king or mermaid queen on our thrown.